I’ve been paying a lot of attention lately to surfaces I run on, and I’m amending my position on asphalt my heretofore favorite surface. I’ve found all along that poorly maintained roads that are breaking apart can be lousy surfaces, full of loose rocks, but I’m not finding that even new surfaces are not always optimal. Tellman Knudson, a VT entrepreneur who is in the process of running barefoot across the US, blogged recently about the best and worst surfaces to run on and he doesn’t really mention asphalt per se. He does talk about “old word pavement” as being good. I really like new, smooth asphalt for running. It’s my favorite surface. But running this weekend in my home away from hometown, Cotuit on Cape Cod, I noticed differences in asphalt, some of which were not so great. Cotuit seems to get treated like a step child by the Town of Barnstable of which it is a part and the roads are a bit of a patchwork. Main Street has a beautiful smooth surface and feels great, but I noticed that many of the aphalt roads are quite coarse. What we commonly call “asphalt” is actually asphalt concrete, a mix if black gooey asphalt and “aggregate” or what we commonly call gravel. The nature of that aggregate and perhaps its proportion to asphalt binder make a big difference on the smoothness of the surface. Whereas new smooth asphalt surfaces can be perfect for running, coarse asphalt, even in good condition) is less comfortable. I found my pretty tough feet experiencing the “tingling” I’ve heard other runners refer to as the traversed the sharpish protruding stone edges. I’ll run in Cotuit a lot this summer, so it will be interesting to see how I adapt. Perhaps the worst surface, by the way, it a new, Cape Cod shell driveway, although my running feet doing better on my drive than they were last summer. 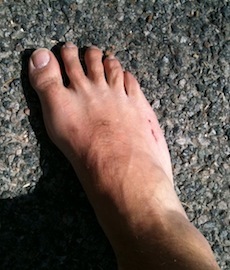 This entry was posted on April 13, 2010 at 6:18 am and is filed under Barefoot Running, Experience, Other Runners. You can subscribe via RSS 2.0 feed to this post's comments. You can comment below, or link to this permanent URL from your own site. I have a question: Have you run barefoot in the rain. I’m up to six miles barefoot but have not run in the rain. I’m worried the water will soften my skin on the bottom of my foot. Maybe nothing to worry about. I’m hoping to run the Groton 10k barefoot on Sunday. Have you run a race barefoot yet? FYI I’m a running friend of Hellie’s. I was the one who gave her Born to Run. I have run in the rain (and snow) and I have noticed that wet feet get more tender. It’s not been an issue for me, but I’ve not tried more than a few wet miles. Interesting question. Let me know what you learn.